Provides effective relief from symptoms of hayfever and other allergic conditions such as pet or dust allergies, these include sneezing, stuffy or runny nose, watery or itchy eyes, itchy nose and throat. It can also be used to treat the symptons of urticaria, also know as hives, where the skin looks blotchy, like nettle rash, with white raised wheals (bumps) surrounded by redness. The product is a white gelatine capsule, available in blister packs of 12 and 24 capsules. For oral use. Swallow with a glass of water. Adults and children aged 12 - 65 years: Take one capsule as necessary up to three times a day. Adults over 65 years: Not recommended. Children under 12 years: Not recommended. If you take more capsules than you should, talk to a doctor or pharmacist immediately. If you forget to take Benadryl Allergy Relief, just take the next dose as soon as you remember. Do not take a double dose. If you have ever had a reaction to this product or to any of its ingredients or the antihistamine Triprolidine. Any sedatives or tranquillisers, as their effects may be increased if taken with this product. If you are taking any other medicines check with your doctor or pharmacist for advice before taking any medicine. Do not drink grapefruit juice while taking Benadryl Allergy Relief. Not recommended during pregnancy or whilst breast-feeding. 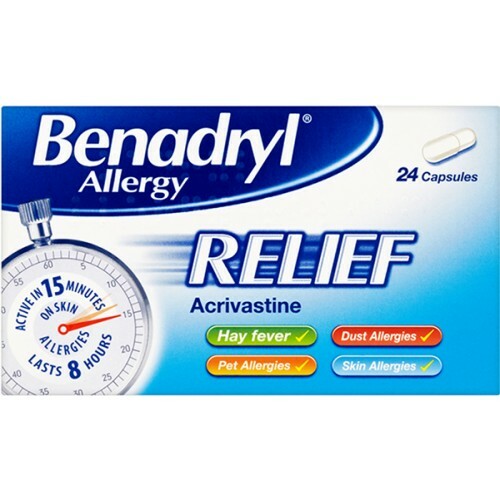 In most people Benadryl Allergy Relief does not cause drowsiness. However, there are rare exceptions and you should take care when you use this product for the first time. If this product makes you feel drowsy, do not drive or operate machinery. Benadryl Allergy Relief should not be taken whilst under the influence of alcohol. Suitable for adults and children 12 - 65 years. Lactose, Sodium Starch Glycollate, Magnesium Stearate, Gelatin, Colouring (E171) and Purified Water.